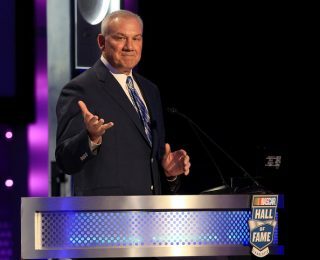 BC Sports Group has reached an agreement with 1999 NASCAR Sprint Cup Series Champion and 2014 NASCAR Hall of Fame inductee Dale Jarrett, who will serve as a pre- and post-race analyst during live coverage of select NASCAR Sprint Cup and NASCAR XFINITY Series racing on NBC and NBCSN. he Newton-Conover, N.C., native earned his first NASCAR Sprint Cup Series victory in August 1991 at Michigan International Speedway in a car owned by the famed Wood Brothers. In the 10 NASCAR Sprint Cup Series seasons that spanned from 1993-2002, Dale achieved 29 of his 32 victories, three Daytona 500 wins, a NASCAR Sprint Cup Series Championship in 1999, and seven seasons among the top five in points. Jarrett raced in his final full season of NASCAR Sprint Cup Series competition in 2007. He made his final appearance behind the wheel in the 2008 NASCAR Sprint All-Star Challenge race, and was inducted into the NASCAR Hall of Fame in 2014. Jarrett joined ESPN full time in 2008, and quickly took over the reins as their lead NASCAR Sprint Cup Series racing analyst, a position he held for the last seven seasons.